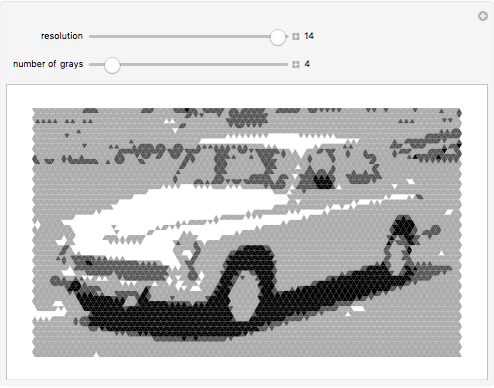 This Demonstration rasterizes an image in a triangular grid. The "resolution" slider controls the raster size and the "number of grays" slider controls the number of gray levels (in other words, posterization). M. Zawidzki and T. Nagakura, "Influence of Grid Type on Agents Behavior in Simulations Performed with Crowd-Z," in Proceedings of the Ninth International Conference on Engineering Computational Technology (ECT2014), Naples, Italy (P. Iványi and B.H.V. Topping, eds. ), Cambrdige, MA: Department of Architecture, Massachusetts Institute of Technology, 2014. www.ctresources.info/ccp/paper.html?id=8505. Am I in a Polygon?